It’s easy to imagine biscuits as part of a meal. They’re most often thought of as bread that’s eaten alongside the meal. Biscuits are capable of playing various roles at the family dinner table. They can be croutons for soup, dressing for poultry, crusts for pies and pizza, or toppings for meat casseroles. The ease and quickness of preparation encourages their use for all meals, even quick weeknight meals to accommodate busy schedules. I ate plenty of tomato soup as a kid. It was a staple at our house. The kind that I ate was opened with a can opener and had cute little kids on the label. Homemade tomato soup entered my life later. It’s so much a favorite now that I keep quality canned diced tomatoes and tomato sauce on hand in my pantry just to have tomato soup when the craving hits. The sodium content in this recipe is sufficient for our taste and, therefore, I didn’t use additional salt. When adding fresh thyme to soups or stews, I don’t bother to strip off those tiny leaves. Tie several sprigs with kitchen twine and remove them before serving. The leaves will fall off naturally while cooking. Heat a large pot to medium high. Add cooking oil and onions and carrots. Cook until soft, about 10 to 15 minutes. Add garlic and cook an additional 2 minutes. Pour in tomatoes, tomato sauce, chicken stock, sprigs of thyme, honey, and black pepper. Cover, cook over medium heat for 30 minutes. Remove thyme sprigs. Purée using an immersion blender. 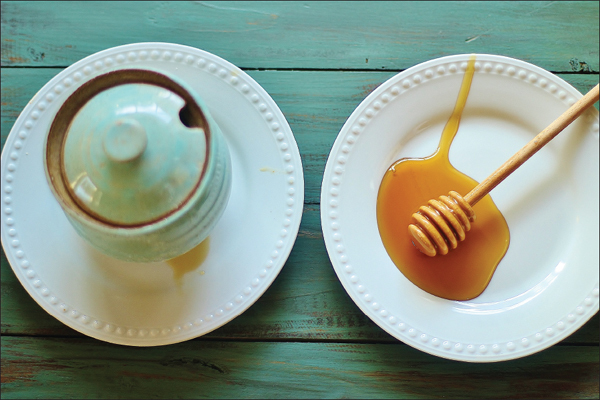 Stir in half-and-half. Garnish with Cheddar Cheese Thyme Biscuits Croutons. Recipe found on following page. Bake croutons until they are crispier and browner than you would biscuits. They can be made earlier in the day and left out to harden a tad, which will keep them from getting soggy too quickly in the soup. The amount of grated cheese will make the dough somewhat lumpy and bumpy. 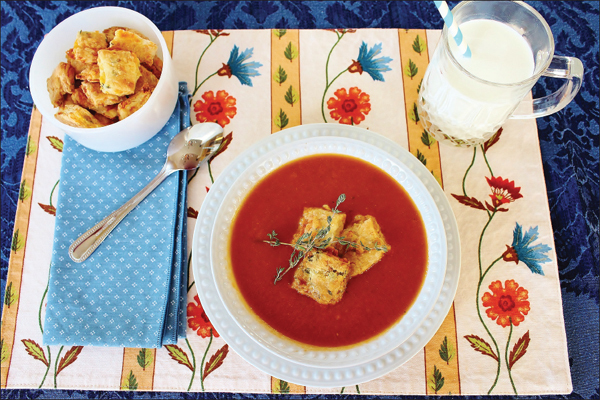 You’ll have a hearty cheese flavored crouton that will complement the soup nicely. Ordinarily, I brush the tops of biscuits with oil after they’re cut and on the baking sheet. For little croutons, I find it easier to brush the dough after it’s rolled out. Be sure to brush the wheel of the pizza cutter, too. Put flour in bowl and cut or rub in butter until flour resembles coarse dough. Stir in cheese and thyme. Add buttermilk and stir until dough is wet. Turn dough out onto a floured surface. Sprinkle with flour. Gently knead and add more flour as necessary, until the dough is no longer sticky. Roll out to a rectangle ½ inches thick. Brush top with cooking oil and brush oil on the wheel of a pizza cutter. Use it to cut the dough in one inch squares. Repeat with scraps. Place on a baking sheet prepared with nonstick baking spray or a baking mat. Bake in a preheated 450° oven for 15 minutes or until crispy and brown. Brining pork and chicken adds a world of flavor and moisture to the meat. I grabbed navel oranges off our tree and made up a brine for these game hens, which resulted in a bird that was fittin’ to eat. We love giblets—all those things that come in that little bag inside poultry. I use them for giblet gravy and always include them in chicken and rice. They were simmered till tender, diced, and put in the dressing for this recipe. *Remove giblet meat from neckbone. Mince along with the organ meats. In a large pitcher, dissolve salt in 1 cup of warm water. Add remaining ingredients and stir well. Wash hens. Remove giblet bag. Set aside. Add hens to 1-gallon storage bag. Pour brine into bag and seal. Store in refrigerator. Brine for at least 8 hours. The hens can stay in the brine solution overnight. Place giblets in a small saucepan and cover with water. Add ½ teaspoon kosher salt and 2 fresh sage leaves. Cover and simmer for one hour or until tender. Set aside. First, toast the biscuits. To toast, place in a single layer on a sheet pan or skillet. Heat oven to 450°. Cook until toasted. Mix all ingredients in a small bowl. Add more stock if necessary to make dressing moist. Rub hens with olive oil. Stuff the cavity of each bird with half the dressing. 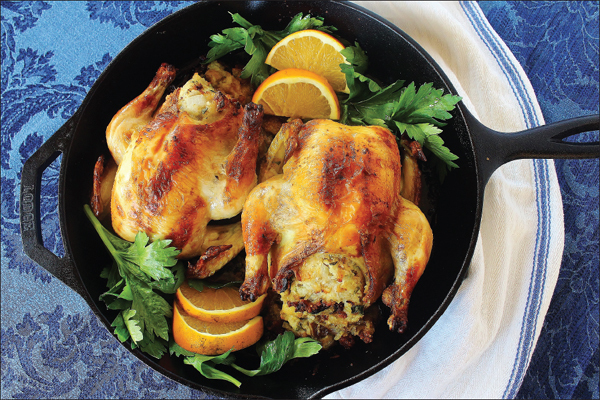 Place breast side up in a large cast-iron skillet. Roast at 450° for 1 hour or until the internal temperature of the thighs reached 165°. Remove from oven, tent with foil and let rest for 10 minutes before serving. A whole bird may be used as one serving. For two servings, split the bird in half lengthwise. Early on a Saturday morning, I noticed arugula and jalapeño peppers in my garden were ready. I didn’t have enough arugula for a salad, just the right amount for a pizza topping. Arugula’s peppery flavor is a nice substitution for sweet peppers. 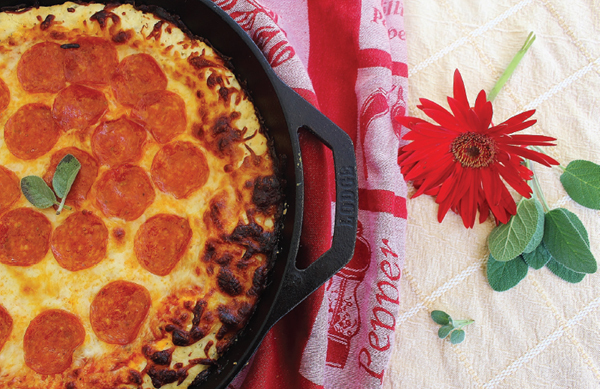 This pizza can be made using one skillet if you caramelize the onions in advance and give the skillet a chance to cool down before placing the crust. It’s important to seed the tomatoes and get out as much water as possible to keep the crust from getting soggy. 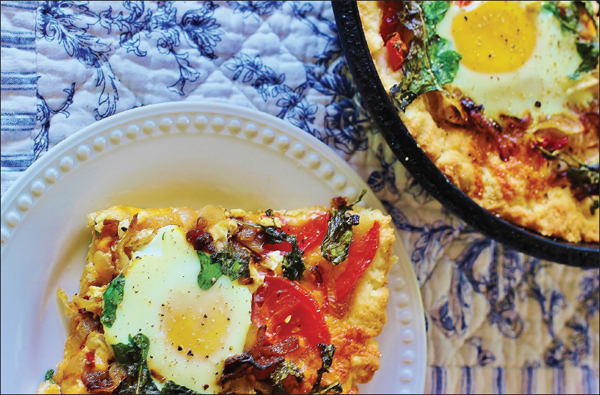 A biscuit crust pizza is made for baked eggs. The crust and the eggs take the same amount of time to cook. In a 9-inch cast-iron skillet, melt the bacon drippings over medium heat. Add onions and jalapeño pepper. Sauté for 10 to 15 minutes or until the onions have browned. Remove onions and pepper from skillet and set aside. Wipe out skillet and let it cool. In a medium bowl, add flour and butter. Rub or cut in until the flour resembles coarse meal. Stir in buttermilk until the flour is wet and forms a ball. Make sure the skillet has a light coating of fat. Place the ball of dough in the skillet. Coat your fingers well with shortening or oil. Spread the dough evenly over the bottom and sides of skillet. Sprinkle cheese evenly over crust. Top with onion/pepper mixture. Lightly tear arugula and spread over onion mixture. Make a small well in the toppings for each of the three eggs. Crack an egg into a cup and gently pour into one of the wells. Repeat with the remaining eggs. Bake at 450° until the crust is browned and the eggs are set to your degree of doneness. Sprinkle with salt and pepper before serving. 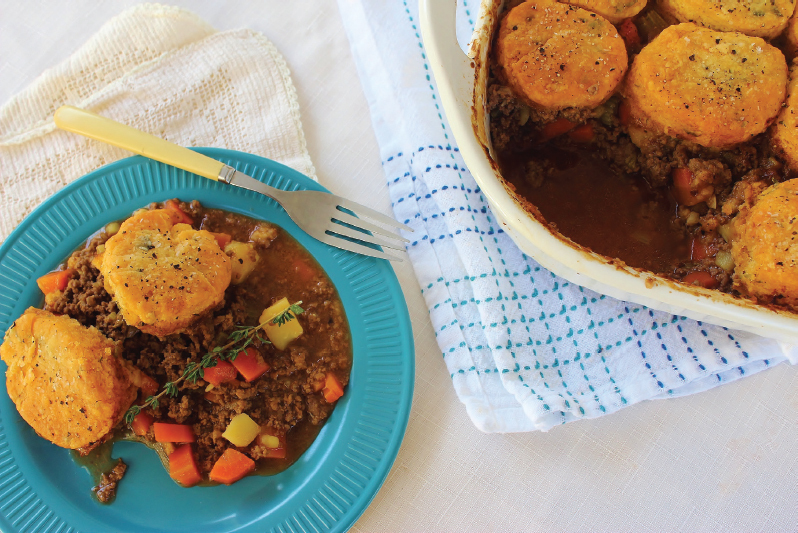 Ground beef and vegetables cook in a light gravy topped with savory biscuits to make a family pleasing dinner. Parboil potatoes and carrots for 5 minutes or until slightly tender. Drain and set aside. Heat oil on medium high in a large kettle or skillet. Add onions and celery. Cook five minutes. Add garlic, cook two additional minutes. Add ground beef to onion mixture. Cook until pink is gone, breaking up ground beef as it cooks. Stir in flour. Cook, stirring constantly, until all the white has disappeared. Slowly stir in beef stock, stirring constantly. Add tomato sauce. Cook until mixture thickens. Add salt and pepper. Taste and adjust seasoning if necessary. Pour mixture into a well-greased 3-quart casserole. Mix in potatoes and carrots. Add flour to large bowl. Rub in butter until flour resembles coarse meal. Stir in herbs. Pour in milk and stir until incorporated. Dough will be soft and sticky. Turn dough onto a well-floured surface. Sprinkle with flour and continue to work it in until dough is no longer sticky and holds its shape. Roll out to ½ inches thick. Cut biscuits with 2½-inch cutter dipped in flour. Repeat with remaining dough. Cover meat mixture with biscuits. Brush tops with oil and sprinkle with salt and fresh ground pepper. Bake at 350° for 40 minutes or until mixture is bubbly and biscuits are browned. Pizza was a lunchroom favorite during my school years. The lunchroom ladies made yeast dough topped with a seasoned meat sauce and then covered in cheddar cheese. Before take-out pizza shops were all the rage, the choices for eating pizza at home were to make a scratch pizza or purchase a store-bought pizza kit that had small jar of sauce, grated parmesan cheese, and the makings of dough. Now-a-days, any flavor pizza your heart desires is but a phone call away. I made this pizza today with my grandchildren. Take-out pizza can’t hold a candle to the pleasure of cooking with kids in the kitchen, especially when the kids call you Nana. The red daisy in the photo was picked by my little Ella as soon as she got to my house today. You don’t get that with pizza delivery. Place flour, Italian seasoning, and garlic powder in a bowl. Stir with hand. Cut or rub in butter until flour resembles coarse meal. Add buttermilk and stir until dough is wet. Turn out onto a floured surface. Sprinkle dough with flour. Gently knead, adding more flour as needed, until dough is no longer sticky. Coat a 12-inch cast-iron skillet with olive oil. Place dough in skillet and sprinkle with olive oil. Press dough evenly over bottom of skillet and partially up the side. Stick several times with the tines of a fork. Bake in a preheated 450° oven for 5 minutes. Spread pizza sauce over dough. Top with mozzarella cheese. Add pepperoni on top of cheese. Bake in a preheated 450° oven for 15 minutes, or until edges of crust are brown and cheese has melted. Sprinkle with Parmesan cheese before eating. Our summer Southern vegetables are heavenly. 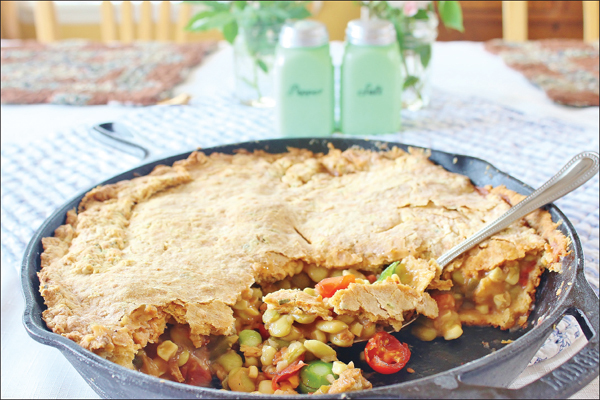 The filling in this pie contains four of my favorites: tomatoes, okra, butterbeans, and corn. There’s an ongoing debate about butterbeans versus lima beans. The tiny green limas are butterbeans to me. Always have been, always will be. My favorite variety of corn is called Silver Queen. A brand called Today’s Harvest carries both frozen butterbeans (tiny green limas) and Silver Queen corn. Their products are high quality and I’ve never been disappointed. This savory pie reminds me of vegetable soup in a crust. I use the skillet to cook the bacon and filling, then pour the filling into a bowl while I prepare the crust in the same skillet. Getting by with only two dirty vessels for a complete meal is a big score. While skillet is still hot from cooking the bacon, add onion, butterbeans, and okra. Cook 15 to 20 minutes on medium heat until vegetables are soft. Stir in flour. Cook and stir until all the white from the flour is gone. Add in tomatoes, with their juice, corn, and chicken stock. Stir well. Crumble bacon and stir into filling. Bring back to a simmer and cook, stirring occasionally, until mixture thickens. Taste for seasoning and adjust. Pour filling into a large bowl. Clean skillet to prepare for making the crust. Place flour in a large bowl. Rub or cut in butter until flour resembles coarse meal. Using hands, stir in cheese, garlic powder, and parsley. Make a well in the flour and pour in buttermilk. Stir with a spoon until the dough is wet. Turn out onto a well-floured surface. Sprinkle flour on dough. Gently knead and add flour, as needed, until dough is no longer sticky and holds its shape. Prepare skillet by coating insides with a thin layer of bacon drippings or solid vegetable shortening. Divide the dough into two pieces. Make one piece a little larger than the other. You need about a 60 to 40 ratio. Using your fingers and hands, press the larger piece evenly along the bottom and sides of the greased skillet. If the dough is sticky, sprinkle with a little more flour. Greasing your fingers helps, too. Once the bottom and sides of the skillet are evenly covered with the dough, pour in vegetable filling. Take remaining piece of dough and roll out to a circle approximately 12 inches in diameter. Transfer the dough to the skillet. I find the transfer is easier if I roll the dough around my rolling pin and then unroll it on top of the filling. Fit the dough on top. If some overlaps, cut it off and use it to patch empty spaces, if needed. If you do need to patch it, simply pat the seams with a wet finger. Brush top crust with vegetable oil or bacon drippings. Cut a few slits in the top for venting. Place in a 350° preheated oven for 40 minutes or until the crust is golden brown and the filling is bubbly. Remove from oven and let sit for 5 minutes before serving. If you’re not aware that Southerners are passionate about barbecue, then you haven’t talked to many Southerners. We love it better than we love our luggage. There are significant regional differences in barbecue sauce preferences, too: South Carolina has mustard-based, North Carolina has vinegar-based, and north Alabama has white mayonnaise–based. Peppered throughout the South is smoky and sweet sauce, which is my favorite. You should know that we consider barbecue a noun, not a verb. Barbecue is what we eat; we don’t barbecue our meat. We cook our meat in a particular manner and add certain kinds of sauces, which turns into barbecue. There’s spelling variations: barbecue, barbeque, and BBQ. Folks don’t seem to be quite as picky about the spelling as they are other aspects of barbecue. We eat lots of barbecue and relish every bite. 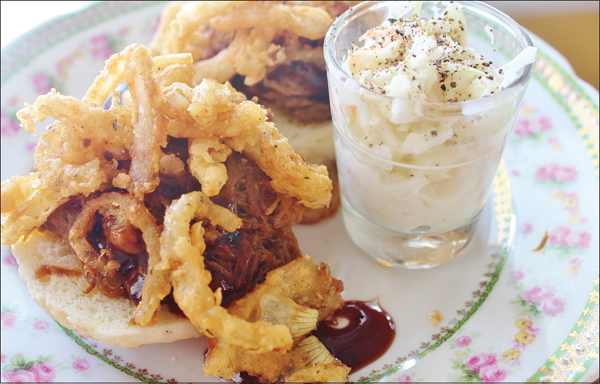 Leftover barbecue chicken, pork, or beef can be used to make a sandwich on mashed potato biscuits topped with fried onions. Place two biscuit halves on a plate for one serving. Top with meat and drizzle on sauce. Add fried onions on the top. Serve with coleslaw on the side. Add sliced onions and buttermilk to a gallon plastic re-sealable bag. Mix until buttermilk has coated all the onions. Mix seasoning and flour in a small bowl. Pour into bag with onions; shake until all the onions are coated. In batches, drop breaded onions in oil that has been heated to 350°. Fry for three to four minutes, stirring frequently, or until golden brown. Drain on paper towel. Season with salt, if desired, while the onions are still hot. Leftover biscuits have many uses. I threw these on the grill and made croutons for our salad. 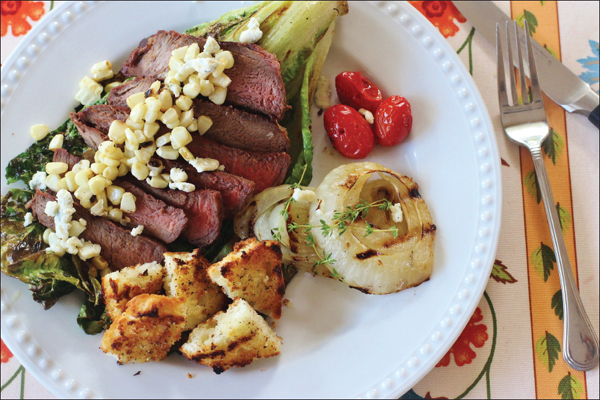 If you’ve never tried charred Romaine lettuce, you’ve missed something unbelievably good. It makes me laugh to think what my grandparents would say about eating burned lettuce! This makes a wonderful vegetarian meal, or you can make the salad along with your favorite grilled meat or fish. Timing is critically important for this meal to come out right, especially if you’re cooking meat. It’s best to cook the meat, remove it from the grill, and tent it to keep warm while the vegetables are cooking. We cooked sirloin steak by marinating it in Dale’s Steak Seasoning for one hour at room temperature. We grilled over medium-high heat for three minutes and flip after every three minutes for a total cook time of twelve minutes. Brush the vegetables with olive oil and season with your favorite seasoning. I use a blend of four parts kosher salt to one part ground black pepper to one part garlic powder. Brush corn, onion slices, and tomatoes with olive oil. Sprinkle with seasoning. Set aside. Drizzle romaine lettuce with olive oil and sprinkle with seasoning and set aside. Place corn and onion slices on a hot grill. Each will take about 12 minutes cook time. Rotate the corn as each side gets grill marks. Flip the onion when it gets grill marks. Remove to a platter when done. Brush the insides of the split biscuits with olive oil. Sprinkle with seasoning. Place the tomatoes and biscuits on the grill. Flip the tomatoes as soon as they blister and start to char. Watch the biscuits carefully and turn once they brown. Remove to a platter. The lettuce is charred last because it takes a small amount of time and needs to be eaten immediately. Place it on the grill and flip it as soon as it’s charred. The lettuce cooks in about 3 to 5 minutes. Assemble the salad on your plate. Drizzle the romaine with your favorite dressing or vinaigrette, if you’d like. I don’t find that it needs additional dressing. I like to cut the corn from the cob but leave the rest of the vegetables whole. Cut each biscuit half in four pieces and place on top of salad. Afew generations back, when backyard chickens were more the rule than the exception, chickens were kept more for egg production than for meat. Young chickens lay eggs and have the tenderest meat. As a chicken ages, the meat toughens and the egg-laying capacity lessens until the old hen “jes’ cain’t lay no mo’.” A young tender chicken, called a fryer, only has one chicken dinner to offer, but dozens of eggs. It follows, logically, that Southerners, especially poor ones in the rural parts of the South, didn’t eat fried chicken every day. It was saved for a special occasion such as Sunday Dinner, especially if the preacher was coming. As hens aged and stopped producing eggs, they were no longer valuable and, in fact, became a liability. They still had to be fed but gave nothing in return. For poor people who could barely scrape by and keep themselves fed, a hen that stopped contributing would soon find itself in pot. Because the old hens had tough meat, they were simmered and stewed for a long period of time until the meat tenderized. A stewed hen could be eaten just as it was and feed a fair number of people. Somewhere along the line, the idea of stretching the meal but adding dumplings came along. Southerners didn’t create dumplings. All cuisines have a form of dumplings known by familiar names such as gnocchi and wontons. Even ravioli is a form of a stuffed dumpling. The addition of dumplings to the pot of stewed chicken created an inexpensive meal that fed a lot of people. Delicious, nutritious, simple, and practical: the hallmark of Southern cuisine. Folks, who often went without sufficient food, got much-needed protein and lots of carbohydrates to fuel them for their high level of daily activity and back-breaking work. Chicken and dumplings were born out of necessity and practicality. My history with chicken and dumplings is spotted and ranges from wonderful childhood memories to personal kitchen failures to shortcut methods to eventual success with scratch dumplings. 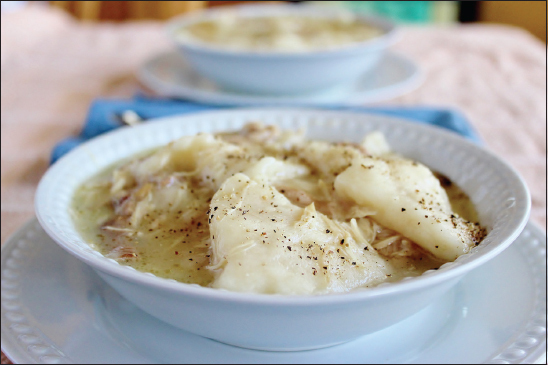 Chicken and dumplings often graced my grandmother’s holiday table. Her dumplings always had perfect texture: toothsome but not tough, tender but yet firm enough to hold up in boiling liquid. As a child, I was allowed to pull up a chair to the stove and drop dumplings into a pot of boiling liquid. Many years later, as a young bride, I thought it fitting that I recreate this favorite dish for my Southern husband. Certainly, the training in my grandmother’s kitchen was sufficient and I didn’t feel the need to consult my grandmother or a cookbook. Stewing chicken was easy and I had done that many times. Now, it was time for me to add dumplings to the pot. What resulted was a big pot of chicken and dumpling. Not dumplings, just one big dumpling. I queried the chief dumpling maker, my grandmother, and her advice to me was surprising. Her flour “tortiller” method worked, and I didn’t give scratch dumplings another thought until a few years after I started writing my Southern food blog. I professed to be a Southern food champion, but felt somewhat dishonest about the proclamation since I didn’t know a hill of beans about making the Southern iconic dish: chicken and dumplings. I wanted to poll my reading audience to determine what dish they would like to see me write about that wasn’t included in my ever-increasing index of Southern foods. I felt I should offer four choices and one was chicken and dumplings. Before I posted the poll, I talked myself out of it. What if chicken and dumplings wins? How on Earth will I explain that I’m a fake and can only make chicken and dumplings using tortillers? So, that option was eliminated just to be safe. Again, before I posted the poll, I had another conversation with myself. You should keep chicken and dumplings in the poll. If that’s what your readers, who are so sweet, kind, and supportive, really want to see, you’ve got to figure out how to make them. That was it! I hadn’t been getting the stock up to a full, rolling boil before dropping them. I didn’t have an eye of the boil. My dumplings were waterlogged and dissolving in the stock. I eagerly gathered all my ingredients, along with my newfound knowledge of an old memory, and set out to make chicken and dumplings. As soon as the stewed chicken was cooked and removed from the stock, I cranked the heat under the stockpot up to high and waited like a child for Christmas morning. Pushing aside the axiom “a watched pot never boils,” I didn’t take my eyes off the stock, eagerly awaiting the arrival of the eye. And, arrive it did. A full, rolling boil created an eye that was a beautiful sight to behold. Dropping the dumplings in, one by one, I held my breath to see if they would hold their shape. And they did. This masterpiece will be a pot of chicken and dumplings, not a pot of chicken and dumpling. My exuberance was dampened by the fact that I couldn’t call Granny and share the good news. I just looked to the heavens and could feel her smiling down on me. Authentic Southern Chicken and Dumplings is time-consuming, although there’s nothing complicated about the recipe. To get an authentic flavor, a whole chicken should be stewed for a couple hours. This dish will only be as good as your stock and chicken. Slow simmering brings out the best flavor of the chicken and keeps the meat from being cooked to death. While the chicken is stewing, make dumplings and set them aside to dry. Once the chicken is sufficiently cooked until tender, remove it from the stockpot and cooled. As soon as it’s cool enough to handle, all the meat is picked from the bone, shredded, and eventually put back in the stock along with dumplings. 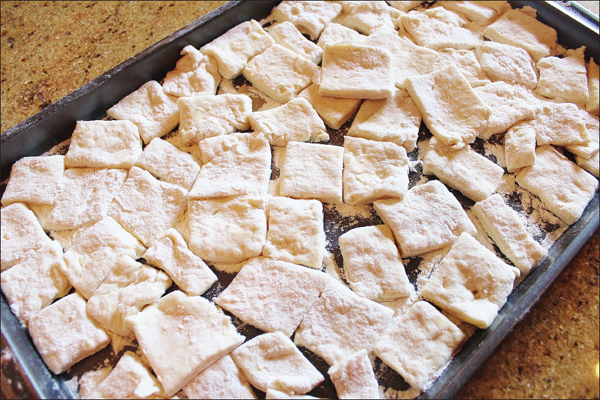 For the dumplings, I use my standard buttermilk biscuit recipe, roll out the dough thin and cut into strips. Wash chicken and place whole chicken and contents of giblet bag in a large stockpot with a colander insert. There’s no need to peel carrots and onions since the vegetables are only used to flavor the stock and will be removed before eating. Add carrots, celery, onion, bay leaves, salt, and pepper to stock pot. Cover and bring to a rapid boil. Reduce heat to simmer. Cook on a slow simmer for 2 hours or until the meat is falling-off-the-bone tender. Remove colander and all the contents from stock. Set chicken aside to cool and discard the rest of the contents of the colander. Remove stock pot from heat. Keep covered. As soon as chicken is cool enough to handle, pick all the meat from the bones, shred it, and set aside. Chop giblets in to small pieces. Discard skin, fat, and bones. While the chicken is stewing, make dumplings and set aside to dry. Add flour to a large bowl and cut or rub in butter until flour resembles coarse meal. Stir in buttermilk and mix until dough is wet. Turn onto a well-floured surface. Sprinkle flour on top. Knead gently, adding flour as necessary, until dough is no longer sticky. Roll out to ½ inches thick. Cut in equal squares using a pizza cutter or sharp knife. Set aside on a floured baking sheet to dry. After all the chicken meat has been picked off the bones and shredded, turn heat up to high understock pot and keep covered. Bring to a full, rolling boil. Remove cover and drop four dumplings, one at the time, into the eye of the boil. Return lid for 15 to 20 seconds or until the full boil returns. Repeat until all dumplings have been dropped in the stock. Add chicken meat, one handful at the time, and cover after each addition to keep the temperature of the stock up. Stir slightly after all meat has been added. Turn heat down to medium and cook for 20 to 25 minutes until dumplings are cooked through.